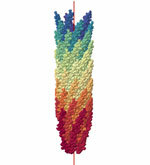 Protein symmetry refers to point group or helical symmetry of identical subunits (>= 95% sequence identity over 90% of the length of two proteins). While a single protein chain with L-amino acids cannot be symmetric (point group C1), protein complexes with quaternary structure can have rotational and helical symmetry. 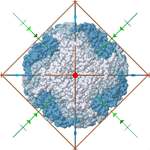 Rotational and helical symmetries observed in protein quaternary structure. 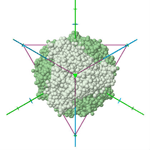 Complexes are considered symmetric if identical subunits superpose with their symmetry related copies within <= 7 Å Cα RMSD. Protein subunits are considered identical if their pairwise sequence identity is >= 95% over 90% of the length of both sequences, to account for minor sequence variations such as point mutations and truncated or disordered N- and C-terminal segments. Protein chains with less than 20 residues are excluded, unless at least half of the chains are shorter than 20 residues. Nucleic acids and carbohydrate chains, as well as ligands are excluded. 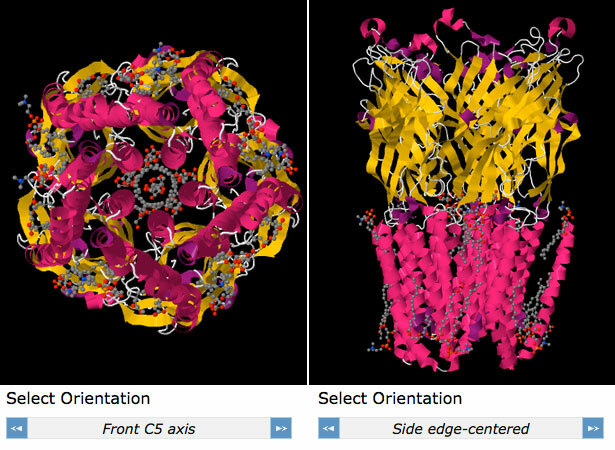 Split entries (entries divided between multiple coordinate files due to the limitations of the PDB file format) are currently excluded from the protein stoichiometry and protein symmetry features. 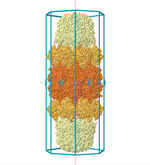 Pseudosymmetry refers to symmetry of homologous protein subunits. Protein complexes with pseudostoichiometry may have a higher structural symmetry than the symmetry calculated based on sequence identity. If we consider hemoglobin again, at a 95% sequence identity threshold the alpha and beta subunits are considered different, which correspond to an A2B2 stoichiometry and a C2 point group. 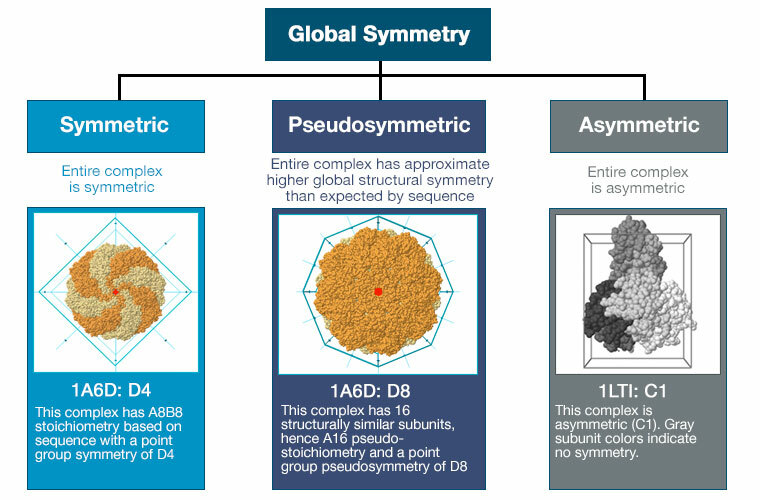 At the structural similarity level, all four chains are considered homologous (~45% sequence identity) with an A4 pseudostoichiometry and D2 pseudosymmetry. Hemoglobin with 4 homologous subunits (Stoichiometry A4) has D2 pseudosymmetry. In addition to the C2 symmetry (red axis), there are two perpendicular C2 axes (blue). Global symmetry refers to the symmetry of the entire complex. 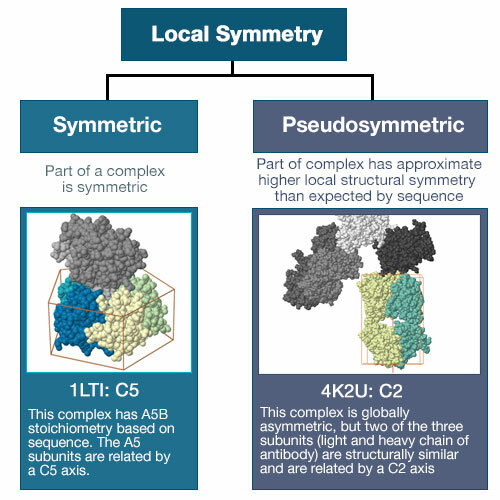 Protein complexes may be symmetric, pseudosymmetric, or asymmetric. 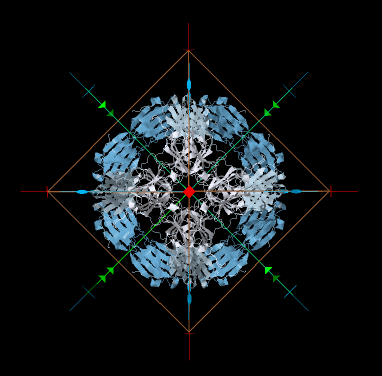 Examples of global protein symmetry. 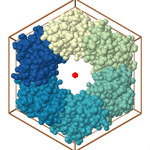 Asymmetric protein complexes may have local symmetry. Similar to global symmetry, we distinguish local symmetry of identical subunits and local pseudosymmetry of homologous subunits. 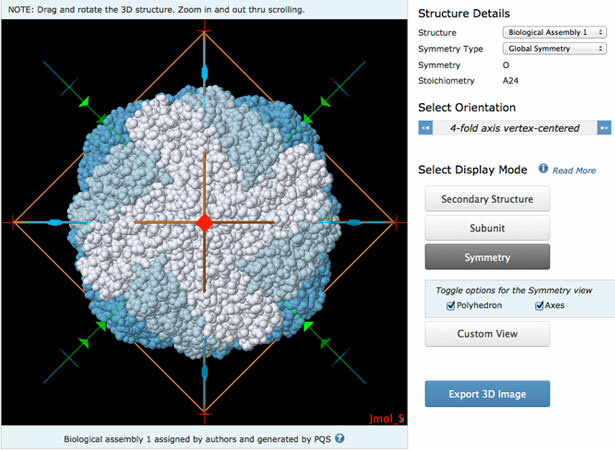 Protein symmetry can be viewed in 3D using Jmol (select the "3D View" link or "3D View" tab on an entry's Structure Summary page). 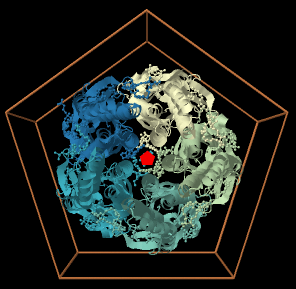 Protein symmetry is calculated for all entries containing at least one protein chain, including asymmetric units and all biological assemblies (except for entries split among several PDB files due to their size). 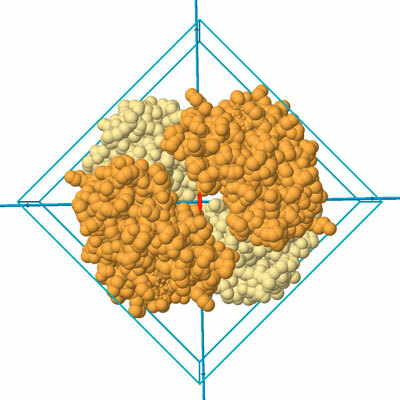 Protein complexes are aligned along the highest-order symmetry axis, helix axis, or along the principal axes on inertia for asymmetric cases. Several default orientations of the structure can be toggled using the < and > buttons. The default orientations are canonical views: sides and back, and along unique symmetry axes. A polyhedron and symmetry axes can be displayed to facilitate symmetry analysis of symmetry. 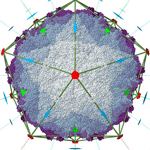 A complex is enclosed in a polyhedron that matches its symmetry. All symmetry axes and their icons representing the fold (ellipsis for 2-fold, triangle for 3-fold axis, or in general a polygon for n-fold axis) can be displayed. For helical symmetry, a helix axis is displayed and for asymmetric cases, the 3 axes of inertia are displayed. Polyhedron and Axes can be toggled on/off using the check boxes in the right panel. Two examples of structures colored by symmetry are shown below. For Cn symmetry (see example on left), the color scheme start at the 12 o'clock position, and the color gradient (light to dark) increases in a clockwise direction. The polyhedron, a pentagonal prism is displayed in a color complementary to the symmetry color scheme. The principal rotation axis is rendered in red with a pentagon representing the 5-fold rotation. In all cubic systems (T, O, I), different layers of the subunit are colored along a gradient (light to dark) from the plus and minus z-axis towards the origin (see example on left). The 4-fold axes are rendered in red, the 3-fold axes in green, and the 2-fold axes in blue. Using the toggle option underneath the Jmol applet, 3 views along these 3 different axes are available. 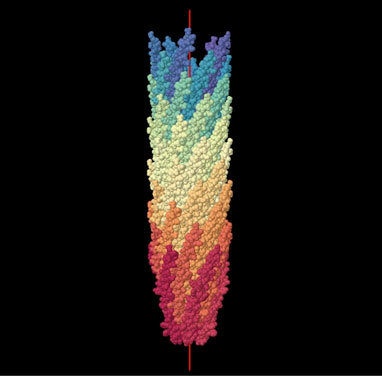 For helical symmetry (H), subunits are colored using a spectual gradient along the y-axis.